Isle of Man Post Office is pleased to present a miniature sheet of stamps to celebrate the Chinese Year of the Snake, which is issued to recognise our attendance at the China International Collection Expo to be held in Beijing later this year. Chinese New Year is the most important celebration in the Chinese calendar. It is also known as the Spring Festival and celebrates the start of new life and the season for ploughing and sowing. 2013 is the year of the black Snake and begins on February 10, shortly after the new moon in Aquarius, the humanitarian of the Zodiac. The Snake is the sixth sign of the Chinese Zodiac which consists of 12 animal signs. It is the most enigmatic, intuitive, introspective, refined and collected of the animal signs. Chinese New Year festivities start on the first day of lunar month and continue until the fifteenth, when the moon is brightest. Before the start of the festivities, Chinese people spring clean their houses to sweep away any bad luck. On New Year's Eve houses are decorated with paper scrolls with good luck phrases such as 'Happiness' and 'Wealth.' Families gather together for a large traditional meal. People will stay up till midnight setting off fireworks to frighten away evil spirits. Red symbolises fire which will scare aware evil spirits, so people dress head to foot in new red clothing. On New Year's Day, children will wake up to find a red envelope filled with money and sweets under their pillows left by their parents and grandparents. Chinese New Year ends with the lantern festival on the fifteenth day of the month. The lanterns are often hand painted with scenes from history or legend. On the Isle of Man many Chinese inhabitants will be closing their businesses to celebrate this special time of the year. David Cheung, owner of China Town on Douglas Promenade explains what Chinese New Year means to him and his family. "It's a very special time. It's the top celebration for family and friends being together and a time for many traditions such as spring cleaning before the New Year and picking a special flower to have in the house. This year my family and I will be celebrating the New Year in Hong Kong with close family." He added: "I very much like the new stamps, they are nice and colour. 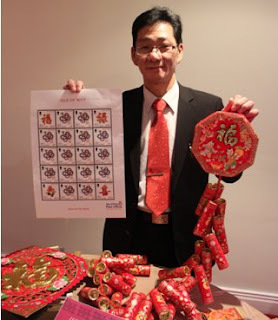 I'm delighted to see the Chinese New Year recognised by the Isle of Man Post Office." Please visit our website at www.iomstamps.com to find out more about The Year of the Snake 2013 collection of stamps and products and to pre-order.